Current gaming trends point to the need for complexity, the need for outstanding visuals and the need to push the boundaries so much that us gamers are consistently wowed. But whilst it’s great to be living in a time where such trends exist, there are moments when all we need, and all we want, is to sit back with something simple, something retro, something which just delivers us a fun time. 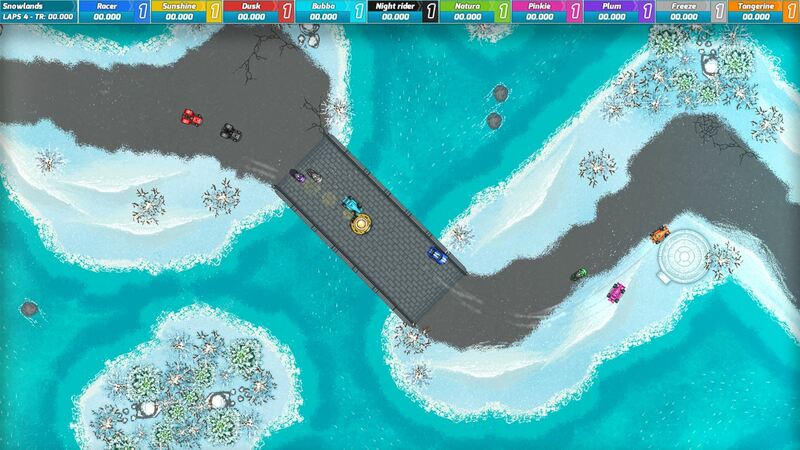 Race Arcade is a big game that mixes little cars, an old school vibe and slick modern aesthetics to create the ultimate in top down racing experiences. It revels in the retro delights it brings, but at the same time plays on the fact that this a game for a modern day gamer. And above all else, it’s done well and is fairly decent fun. 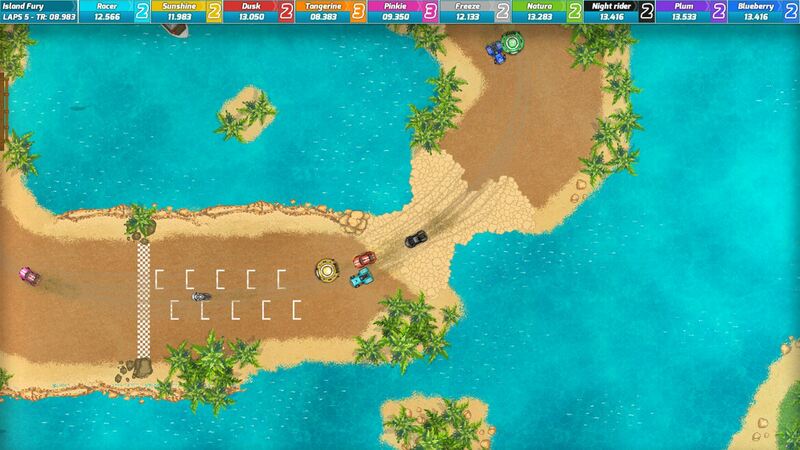 You won’t ever be left astounded by what Race Arcade delivers in its deep career, local multiplayer options or simple time trialling additions. But you’re not meant to be and the development team at Iceflake Studios have quite obviously focused on just creating a game that will keep you playing for a good few hours, with no fuss and no bother. At the heart of the action is the career mode and for a game that comes across as simple, this is pretty damn deep. Six car classes each come with three different championship types and three difficulty levels. 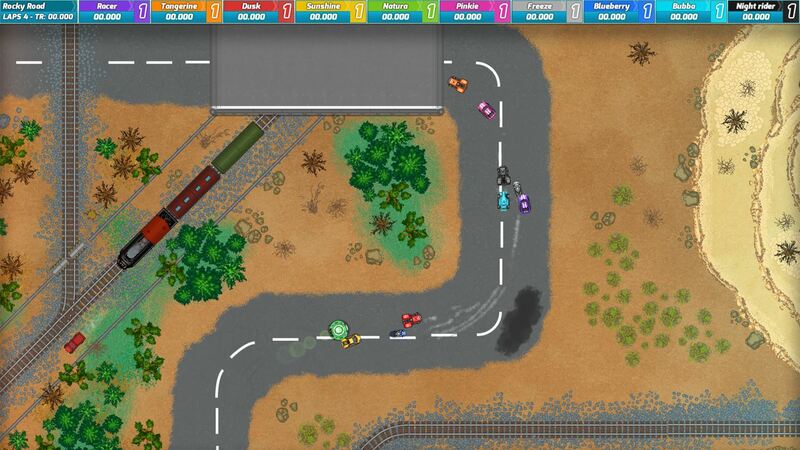 You will find yourself racing around different circuit types in rally, sports and formula one cars, tractors, motorbikes and, rather strangely, UFOs. Each vehicle handles differently, with unique engine, tyre, torque and handling stats all present. 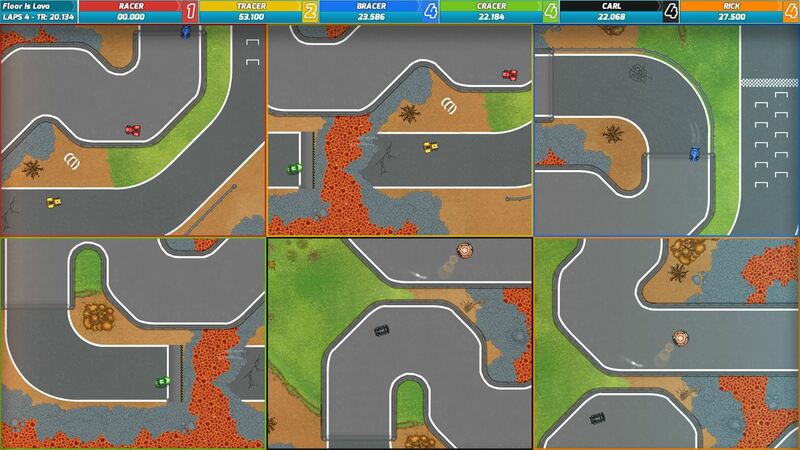 All are easy enough to get the hang of though, except for the damn sports car and its super drifty ways. But even then, it’s still good fun to use. As is the case with nearly every racer under the sun, the aim is to take to the track alongside numerous AI controlled vehicles, with the express intention of ending the race in first place. Doing so will earn you championship points, which in turn reward you with cash, so you can unlock the next vehicle and championship in the career list. Like I’ve alluded to previously, it’s all simple stuff and nothing will ever tax your mind or skills. Circuits are tight, twisty and well created with plenty of variation from one to the other, ensuring that a variety of driving skills are needed throughout the entire career. With an old school vibe, you could well be forgiven for thinking that each track has just been flung together without a care in the world. But the little details are all there, with enough oil spills, jumps, tunnels and more to distract you from the race at hand should you let it do so. But the racing is close enough, and stressful enough, to hardly ever allow you to get distracted by what is happening on the outskirts, with the defined tarmac, ice, dirt and more keeping your mind focused. Shortcuts are possible, but aside from a couple that are meant to be used, if you find yourself deciding to cut corners too much, will quickly find that your lap is invalidated, putting you in last place and needing to cane it more than usual in the hope that you will catch up. But with the ease in which a race can be won, and the short time it takes to complete a circuit, you need not worry too much about trying to cut corners anyways. Unfortunately, the AI you find yourself up against can be a bit dumb, and will happily get stuck in silly places leaving you a clear run to the end. This is more of an issue when racing the UFO seasons as the width of the vehicle and the tight twisty tracks lend to huge pile ups which the AI can’t seem to escape from. Even when they try to respawn to a safer place, you’ll still find them smashing into one another and failing to take corners correctly. The issues with these vehicles are so prominent in fact, that if I’d stopped playing Race Arcade before unlocking the UFO championships then you may well have found me adding an extra half star to this review. But the fact of the matter is that the AI is so lacking of intelligence, and the UFO vehicle so large and unwieldy, that all too often it ends up in a respawning jumble which is either too easy to win or just difficult to avoid. This is a shame, because if there was a bigger challenge from the computer controlled opponents, the career of Race Arcade would prove to be a much more challenging affair. Instead, in the few hours it took me to complete every single championship possible, only occasionally did I not win without hassle. Yes, I had to sometimes restart a race, but that was mostly due to the multiple barging opportunities going against me, with my vehicle pushed off to a part of the track where it wasn’t worth the hassle in trying to catch up. The problems occur when you purposely get barged off track, especially when flying through the air after a jump. This can see you stuck in a section that you can’t get out of, or, as is even more the case, left to land on a bit of track that puts you a lap down. It’s a hard pill to swallow, and whilst the AI aren’t particularly aggressive, when you decide to mess around with mates, you can only imagine the chaos that ensues. Once you’ve completed the 18 career championships and are looking for further Race Arcade opportunities, then you are left with just the single race and time trial hot laps that are in place. If I’m honest, these hardly suffice as game modes in themselves and due to their very nature, you’ll never spend too long with them. Once the career and achievement collection fun is over, then you’ll probably be done with Race Arcade. But it’s always good to know the extra options are there should you wish to waste a couple of minutes. 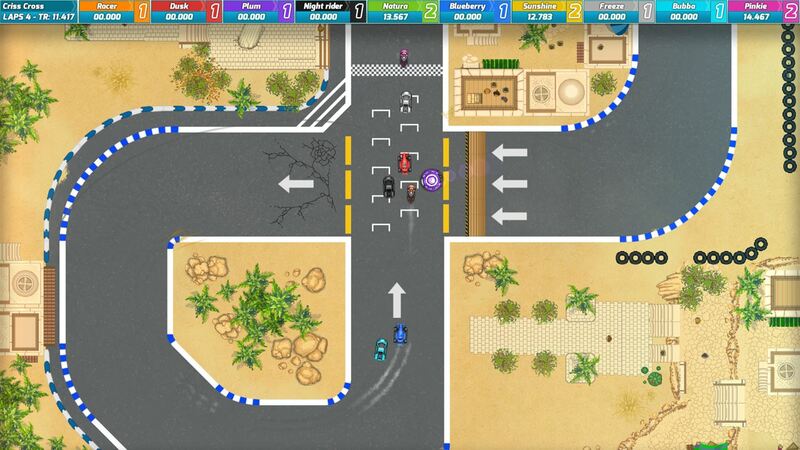 Thankfully, also in place and begging for a bit of your time is the multiplayer mode, which allows you and up to five friends the chance to battle it out in single screen racing. It’s just as fun as the solo career, and whilst it’s disappointing to not see any online mode in place, and it’ll not keep you going for weeks on end, for the odd night of beer enhanced local gaming sessions, is worth a little look. The inclusion of a couple of different viewpoints help the multiplayer side of things massively too. Whilst Iceflake have ensured those who wish to mess around with camera options get near, medium, far and dynamic choices in the solo player modes, multiplayer can be played either on one screen or via split screen. Personally, I think the zoomed out viewpoint is preferable over the split screen option, but both work well with no issues. And that’s about all Race Arcade has to offer. At the end of the day it is a fairly decent top down racer which, without blowing you away, will keep tempting you in with a deep career mode, comes with a great feel to the controls and allows for some tight close racing. It has its problems, most notably when the AI is left in charge of the UFO and that the included currency system is made redundant after just a few races, but for simple racing fun, at a cheapish price, it’s probably just about worth a shot. Iceflake Studios have proven that you don’t need to push every boundary possible in order to create a good game. You just need to ensure it has been injected with a dose of fun. And Race Arcade has just about been given that.